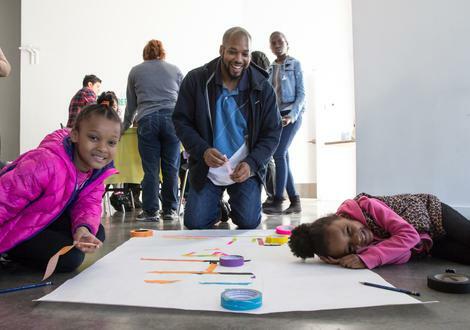 Family Affair is a seasonal afternoon program on select Saturday afternoons that promotes the special bond between parents/guardians and their children (ages 12 and under) through art-making and exhibition tours. 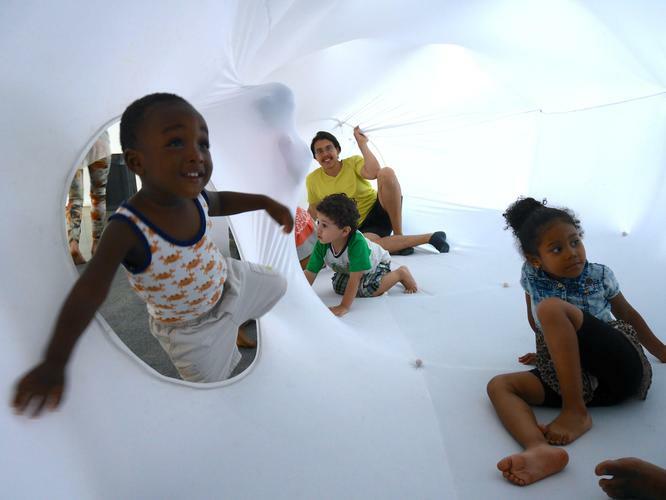 Family Affair offers an ever-changing program that includes hands-on activities developed in collaboration with teaching artists, performances, guided tours, screenings, and many other surprises. Check out upcoming Family Affairs here! 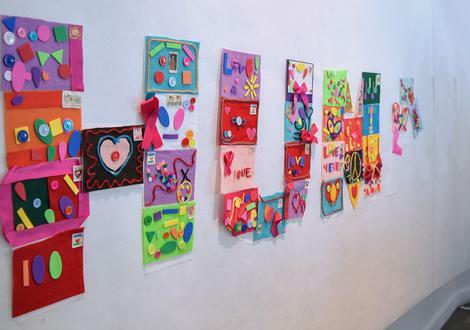 At Family Affair: Arts 'n Hearts, families worked together on this beautiful Quilt of Humanity. The quilt is made out of squares, each containing a coded message of love designed by a participant. All the squares were joined together to create the word HUMANITY. We were so touched and inspired by these personal contributions, we wanted to share this project with everyone. The completed quilt is pictured at the top of the page. Thanks to all who participated in making this quilt, along with museum educator Fatima Sambo Schoenfelder, who led the activity. Family Affair is made possible by Con Edison and New Yankee Stadium Community Benefits Fund. Education and Community Programs are generously supported by Booth Ferris Foundation, Deutsche Bank, Laurie M. Tisch Illumination Fund, Malka Fund, New York State Council on the Arts with the support of Governor Andrew M. Cuomo and the New York State Legislature, New York Yankees Foundation, Pierre and Tana Matisse Foundation, O'Grady Foundation, Stavros Niarchos Foundation, Target, William Talbott Hillman Foundation, and New York City Council Member Vanessa L. Gibson, Council Member Diana Ayala, and Council Member Ruben Diaz Sr.